An incomplete cast copper alloy Roman Colchester derivative, 'T-shaped' brooch, dating to the early Roman period. 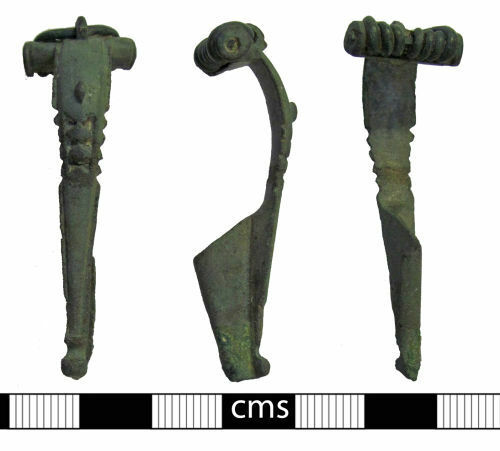 The brooch has a tapered bow and foot-knob with short rounded wings with coiled spring secured by a forward facing hook on the top of the head, in the Colchester B style. The spring is incomplete with the pin missing. About halfway down the length of the bow is a short row of four teeth, leading to this type of brooch being nicknamed the 'sawtooth'. Just above this decoration is a small lozenge-shaped stud. Between the sawteeth is a panel of three raised lozenges, the recesses having been cells to hold decorative enamelling, all of which is now missing. The catchplate on the reverse of the brooch is intact. Although termed a 'sawtooth' brooch, Hattatt (1985:96) classes this and similar examples as as the precursor to the 'mature' sawtooth brooches, which have teeth down the whole length of the bow (ibid). They are often found in central southern England, with Oxfordshire cited as a common findspot. Excavated examples date from c. AD 70 to 180. This is the 10,000th BERK- find recorded.